With Valentine’s Day just around the corner British Airways helped a Royal Navy hero pull off the proposal of a lifetime. Lieutenant Lee Colthart popped the question to his girlfriend, Lydia Ayto, in the Caribbean . Lee, who is originally from Fife in Scotland, said he was desperate to take his girlfriend, who is a navigator in the Navy, back to paradise to ask her to be his wife. The airline stepped in to help surprise Lydia with a whirlwind tour of three beautiful islands, and a cocktail of once-in-a-lifetime experiences, ending with a very special question for Lydia to answer. Lee and Lydia who live in Somerset, met at naval training college in Dartmouth in 2010, but since then have spent months apart as they have both been deployed around the world on tours lasting as long as seven months. Later this year Lee will be stationed abroad for five months, meaning the newly engaged couple will be apart for Christmas. Their island-hopping adventure saw them fly in First and on arrival in Barbados were whisked by Rolls Royce to the newly opened Sandals Royal Barbados Resort, where the keys to a standard room were swapped for a set to their sumptuous beach front butler suite. They then watched the sun set from a private catamaran cruise, tasted fine rum at the island’s oldest distillery and dined at celeb-haunt The Cliff. Next, the couple were driven to the exclusive Jet Centre like VIPs before boarding their private jet to ‘Spice Island’ in Grenada, where they spent time zip-lining through the jungle and soaking up the island’s sun, sea and unspoilt views. After making the 20-minute British Airways flight from Grenada to Saint Lucia, the couple were chauffeured to Sugar Beach Hotel to enjoy private dining in front of the world-famous Piton mountains. 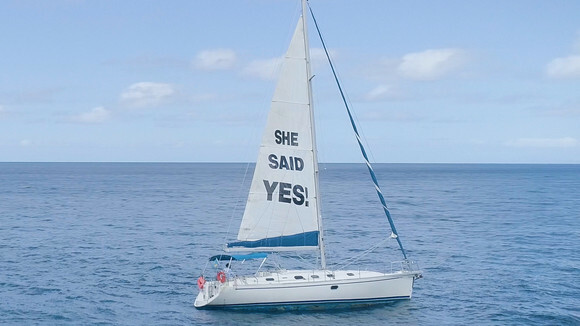 The following day Lee got down on one knee in front of a 43-foot sailing boat with the words: ‘Lydia will you marry me?’ emblazoned on the sail, which when turned also revealed the words ‘She said yes!’ on the other side. British Airways flies to Antigua, Barbados, Dominican Republic, Grenada, Jamaica, Saint Kitts, Saint Lucia, Tobago, Trinidad, Turks & Caicos from Gatwick, and the Bahamas and Grand Cayman from Heathrow. The airline has a long history with the Caribbean and has been flying to Barbados for more than 60 years. Barbados - British Airways Holidays offers seven nights at the 3* Halcyon Palm, from £669 per person, travelling May 1 to May 31. Includes World Traveller return flights from London Gatwick and accommodation. Book by February 27. For reservations visit ba.com or call 0344 493 0120. Antigua - British Airways Holidays offers seven nights at the 3* Starfish Jolly Beach Resort , from £899 per person, travelling September 1 to 31 September 2018. Includes World Traveller return flights from London Gatwick and accommodation with All Inclusive. Book by February 27. For reservations visit ba.com or call 0344 493 0120. Grenada - British Airways Holidays offers seven nights at the 3* Grenadian By Rex Resorts, from £1039 per person, travelling October 1 to October 31. Includes World Traveller return flights from London Gatwick and accommodation with All Inclusive. Book by February 27. For reservations visit ba.com or call 0344 493 0120. St Lucia - British Airways Holidays offers seven nights at the 4* Marigot Beach Club & Dive Resort , from £899 per person, travelling September 1 to September 30. Includes World Traveller return flights from London Gatwick and accommodation. Book by February 27. For reservations visit ba.com or call 0344 493 0120. Tobago - British Airways Holidays offers seven nights at the 3* Grafton Beach Resort, from £729 per person, travelling November 1 to November 30. Includes World Traveller return flights from London Gatwick and accommodation with breakfast. Book by February 27. For reservations visit ba.com or call 0344 493 0120. The airline is also adding a romantic touch to its inflight entertainment this Valentine’s Day with the introduction of a new category – Love is in the Air. Page ContentRunning until the end of February, the category plays host to a collection of films, TV shows and audio programmes, including classics like When Harry Met Sally, Chocolat and Love Me Tender. The BA Magic campaign began in 2017, and since then the airline has surprised several deserving customers with special money-can’t-buy experiences. For more information or to watch the series of stories, visit: www.ba.com/bamagic. From summer 2018, British Airways will also be sharing the stories on its inflight entertainment system.